Pan's Labyrinth (Spanish: El laberinto del fauno, literally The Labyrinth of the Faun) is an Academy Award-winning Spanish language fantasy movie written and directed by Mexican movie-maker Guillermo del Toro. Pan's Labyrinth takes place in two places, known as a dual setting: in the "real world" the story is set in Spain during 1944, and tells a story of a girl named Ofelia who is given three tasks by a mysterious faun. Meanwhile, her stepfather, the Falangist Captain Vidal, hunts the Spanish Maquis, guerrillas who continued fighting the Franco regime in the region, as her pregnant mother grows ill. The alternate setting is a secret "fantasy world" that Ofelia enters through an overgrown labyrinth garden, where she meets all manner of strange and magical creatures who become central to her story. The movie uses make-up, puppetry, and CGI effects to create its creatures. The director of this movie, Del Toro said that he thinks the story to be a fable, influenced by fairy tales, and that it focuses on and continues themes related to his earlier movie The Devil's Backbone, a spiritual sequel, though not an actual sequel. The original Spanish title refers to the mythological fauns of Greek mythology, while the English title refers specifically to the faun-like Greek god Pan (intended to help English-speakers differentiate the title from the term fawn). 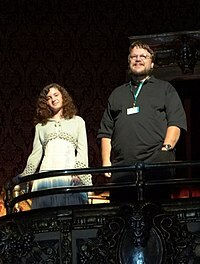 However, Del Toro has stated that the faun in the movie is not Pan. The movie was first shown at the 2006 Cannes Film Festival. It was released in the United Kingdom on November 24, 2006. In the United States and Canada, the movie was given a limited release on December 29, 2006, with a nationwide release on January 19, 2007. Pan's Labyrinth has won numerous international awards, including three Academy Awards, the Ariel Award for Best Picture, and the 2007 Hugo Award for Best Dramatic Presentation, Long Form. ↑ "EL LABERINTO DEL FAUNO – PAN'S LABYRINTH (15)". British Board of Film Classification. 6 July 2006. Retrieved 13 April 2013. ↑ (78% Spanish production, 22% Mexican production) "EL LABERINTO DEL FAUNO" (PDF). Retrieved 21 June 2015. ↑ 3.0 3.1 "Pan's Labyrinth (2006) - Box Office Mojo". boxofficemojo.com. Archived from the original on 16 September 2017. Retrieved 6 April 2018. ↑ "Pan's Labyrinth (2006)". Box Office Mojo. Retrieved 2007-02-12. This page was last changed on 22 December 2018, at 17:37.